24 x 4 100 ft.
16 x 4 100 ft.
24 x 4 50 ft.
12 x 4 100 ft.
8 x 4 in. 100 ft.
16 x 4 50 ft.
12 x 4 50 ft.
8 x 4 in. 50 ft.
Snake for bands on a budget. Great pricing here on four-send snakes with a variety of configurations. The four returns are XLR, with 8, 12, 16 or 24 channel input configurations. Choose the input scheme and the snake length from the dropdown menu. Available in 50' or 100' lengths. Each input is labeled and color-coded. Returns are coded alphabetically (A, B, C, and D). These affordable snakes are also great for fixed installation. 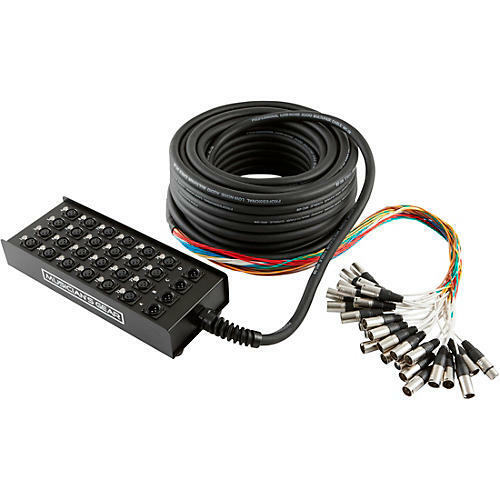 A durable, heavy-gauge steel box protects all of the XLR connecters.